Probably the most vintage room in my home is my laundry room. 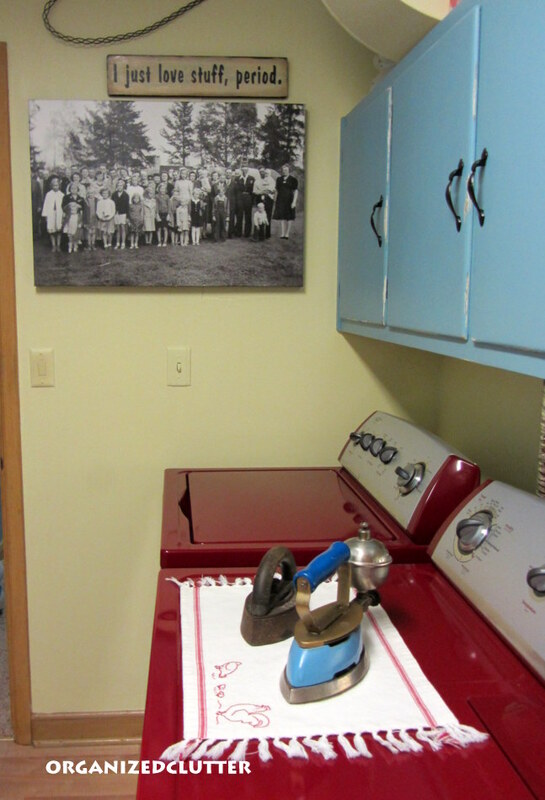 Aside from the modern conveniences of an automatic washer and dryer, the decor is all vintage, and in full color. This is a view from the kitchen doorway. The walls are yellow and the cabinets are turquoise with black hardware. This wall display is a mix of old trays, (including a Coca Cola tray on top), old bowls, washboards, a Ball jar sign, embroidered pictures, and a vintage drinking water bag. 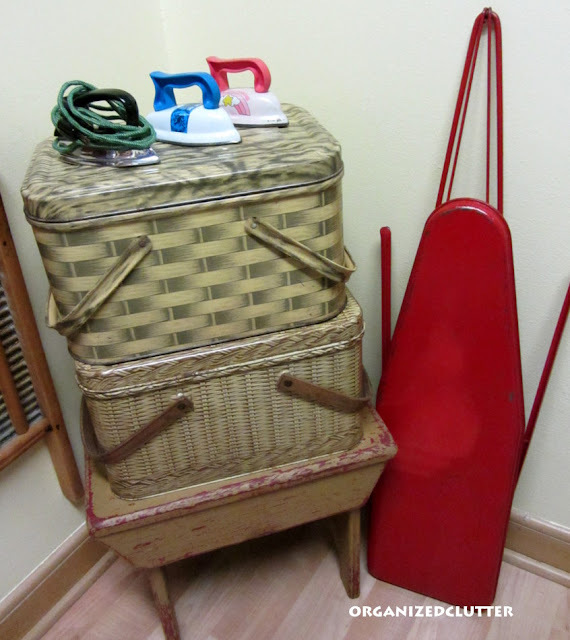 In the corner are vintage metal picnic baskets, a stool, my childhood ironing board and some irons. There is also a clothes bar here for hangers. I found the little vintage travel iron at a thrift shop, in it's original box, earlier this year. On the right on two metal toy irons. This Eagle Brand Drinking Water Bag is in excellent shape but quite old. 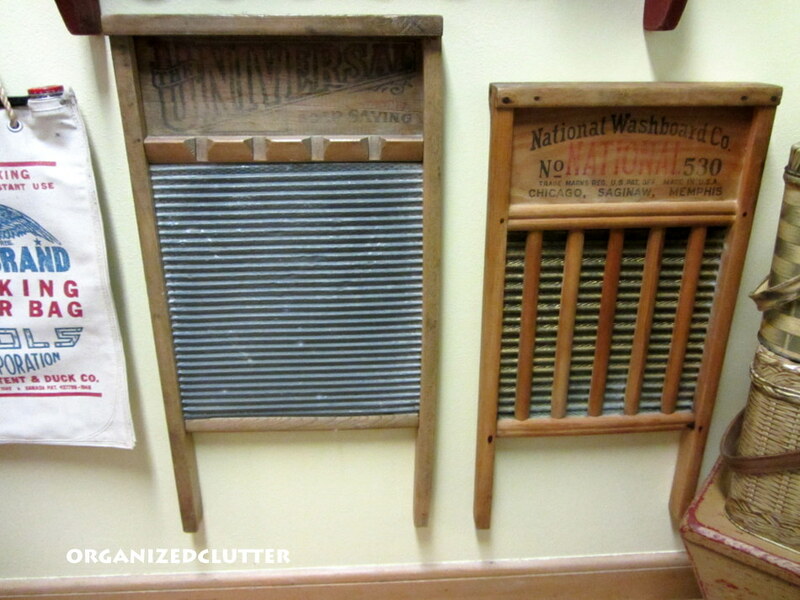 The washboards are a little cliche for a laundry room but I like them. 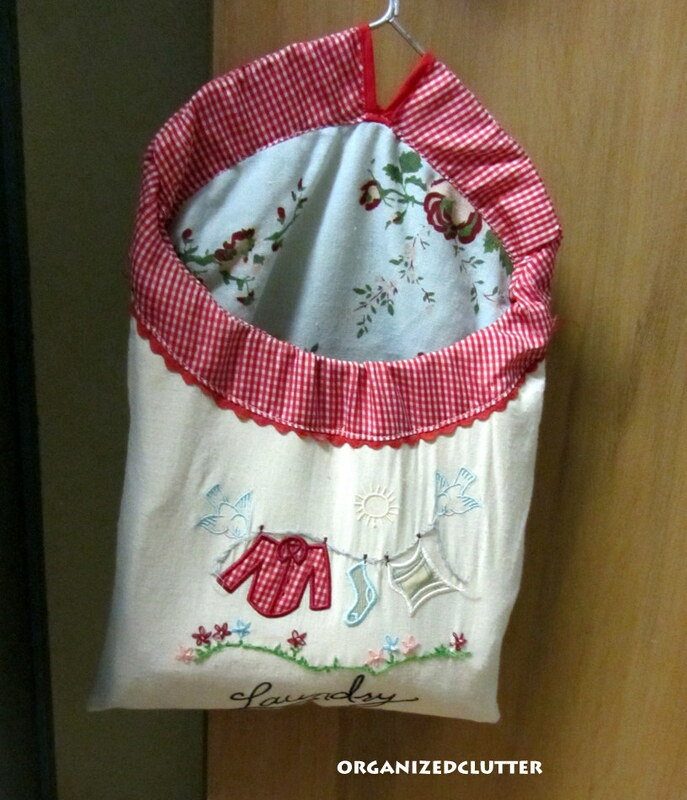 Not old, but vintage looking clothespin bag. My red Whirlpool washer and dryer. More irons. The Canvas on Demand 1940's photograph canvas covers our electrical box. My laundry room has no windows, it's in the middle of the house. The area on the right above the cabinets is dark as duct work blocks the ceiling light. I have a Dept 56 snowman cookie jar, a McCoy Pillsbury doughboy cookie jar, and a vintage Ideal Ironstone Pizza Pie chef plate. 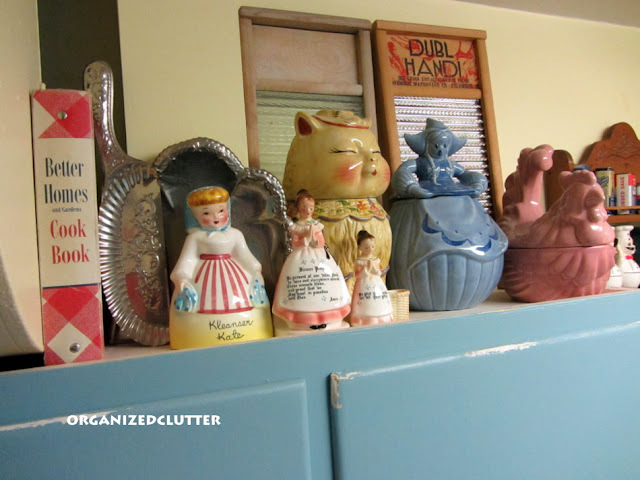 More kitsch on top of the laundry room cabinet. The cook book was my Great Grandma's. 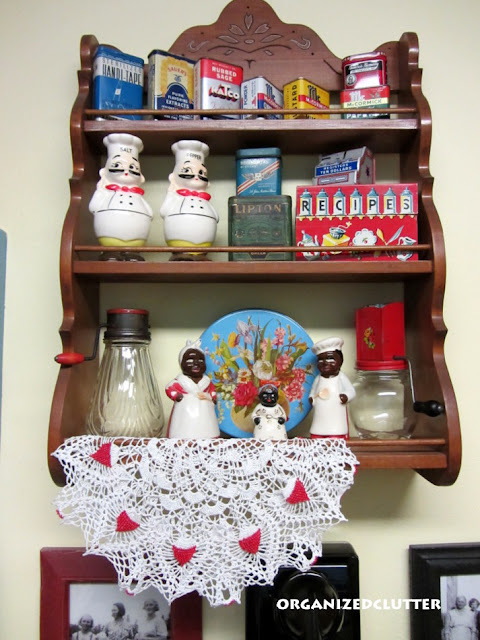 The Red Wing Dutch girl and pink rooster cookie jars were my Grandma's. More color with vintage kitchen tins and salt and pepper shakers. If you have been following my nostalgia posts this month, you will recognize this wall and my vintage telephone. This is the view from the other doorway of the laundry room off of the hallway. That's it, my laundry room. A very vintage riot of color that makes clothes washing a little more bearable! You have so many great treasures! I have that same black cola tray....it was my mom's. I love just about everything in your laundry room...it is such a nice size too! Love how you hung all the way to the floor. Oh my gosh, LOVE the reveal of the whole room. Loving all the vintage pieces -- especially your very own childhood ironing board. I can't wait till the day I can have a 'finished' laundry room. 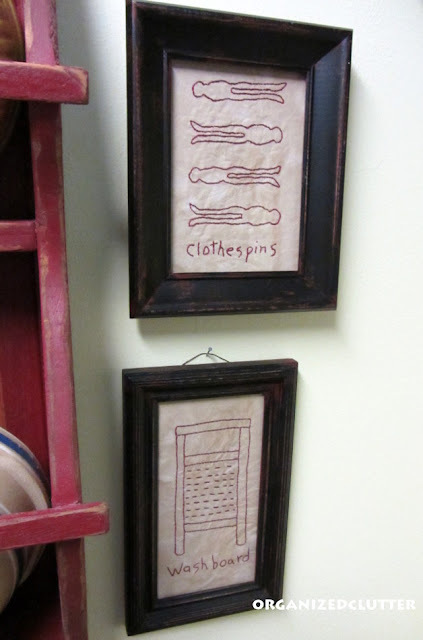 I am going to embroider some laundry room art too... love yours. Such a sweet room -- you done great!! PS I've never seen a washboard with the wood bits running vertical. Interesting!! I love all your color! And all your fun vintage decor. How nice to have such a large space. My laundry room is also in the middle of our house, a room off the hallway. Its still all white everything is white in there. It will be our winter project. I love your room its very happy and since we have to do laundry why not make it pretty! What a fun room to do laundry in...love it!! Gorgeous, your laundry room reveal, it really turned up just great. I also love the touches of decor, which makes it so inviting and warm. I just did mine too and so I know what you mean...you even want to do laundry, lol! Have a happy week. What a fabulous laundry room. Love the colours you used, and you have so many fabulous vintage pieces. I just love it! What a beautiful room! Does it make you want to do laundry all the time? LOL my gram had one of those ironing boards and a real electric iron and I used to love ironing handkerchiefs and pillowcases on it. This is so cute and the details are just wonderful! I viewed this a couple of times for ideas and to make sure I didn't miss anything. 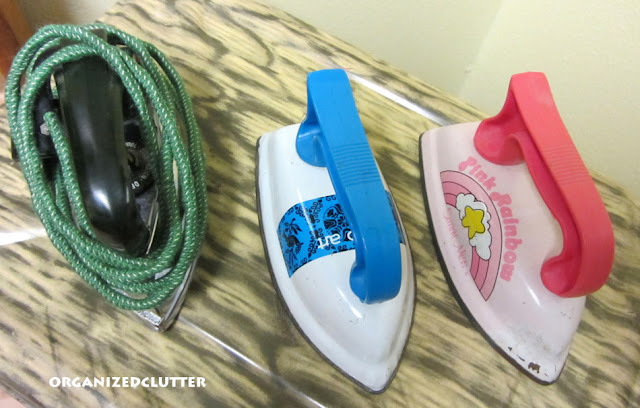 My favorite is the cute children's ironing board and irons. 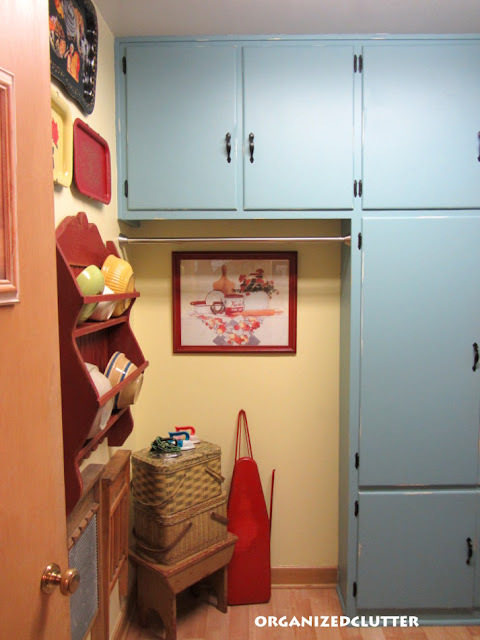 Your blue cabinets are perfect with the red washer and dryer. I love your vintage decor! 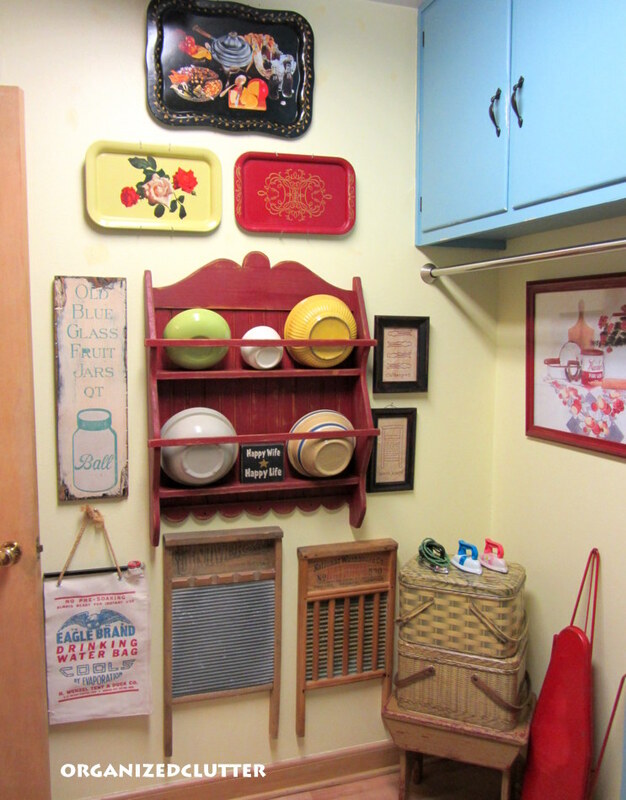 You have a beautiful vintage laundry room, Carlene! It puts a smile on my face to see all your treasures. CARLENE!!! Unbelievable!! Oh my this is such a fabulous laundry room I don't have words!! You have more cool stuff than anyone I know! We have the same Coca Cola tray...maybe you mentioned that and I forgot. LOVE the color of the cabinets too. Love everything! Carlene it would be delightful to do laundry in this cutie pie of a room. I love all your vintage goodies! Hi Carlene! Oh, yours is just the sweetest cutest laundry I've ever seen. Love all of the color and all of your little vintage pretties! The shelf is adorable. 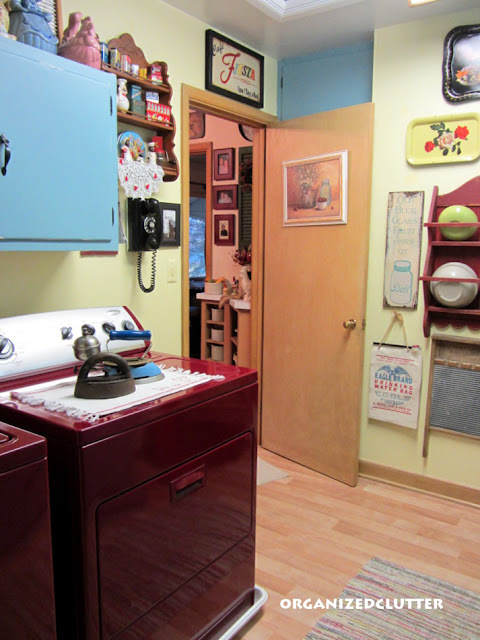 I LOVE your laundry room filled with happy color and all your vintage goodies! Washing clothes would be fun in your house! What a great room filled with so many vintage goodies that delgiht the eye!! I am sorry that I have not been able to visit too much as I have been very busy so i am playing catch up! Now this is one laundry room I wouldn't mind doing laundry in! It's like a cute, cute vintage cottage--one you just want to cuddle up in! So bright and "happy".. . .Love it! I would love to spend time in your laundry room with all it's treasures. My laundry room contains dirty laundry period. Oh...My goodness! 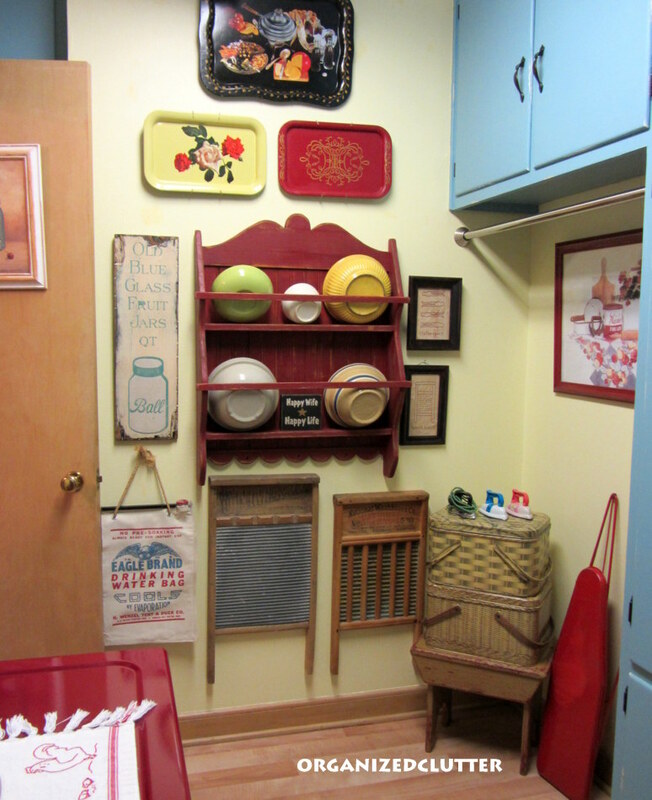 Your laundry room is a palace with all the bright reds and charming nostalgia. I wouldn't mind doing laundry one bit if I could spend all day in that delightful setting! I love those trays on the wall! 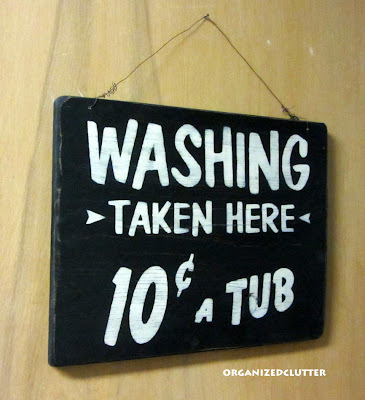 I may just have to decorate my ugly laundry room. I never thought about it until i started blogging, but it really is a little too boring right now. I appreciate so much of what you have in here. The cord alone on that one black and metal iron takes me right back. Remember that well. And I love a clothespin bag. We spent so much time of our childhood outside and my mom was always out there hanging up or taking down clothes. What a great laundry room! Carlene your laundry room is a riot of wonderful color. What a collection of vintage treasures! 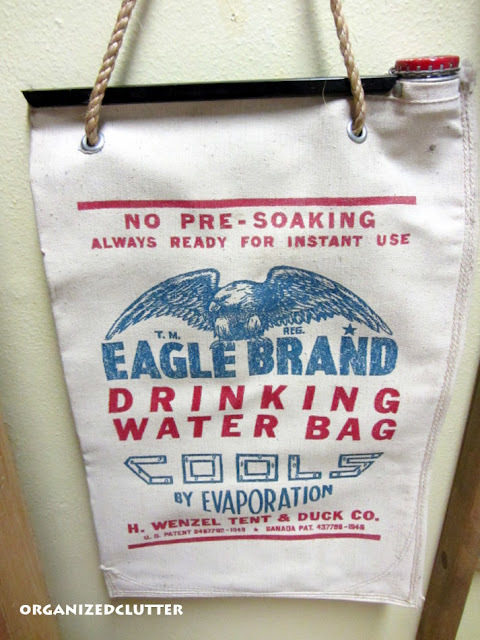 I too have decorated my laundry with vintage items. My cabinets are boring wood but I hope to change that soon. Wanting red cabinets. I have one of my hubbys grandmothers old dustpans and quite a few vintage irons and laundry products. 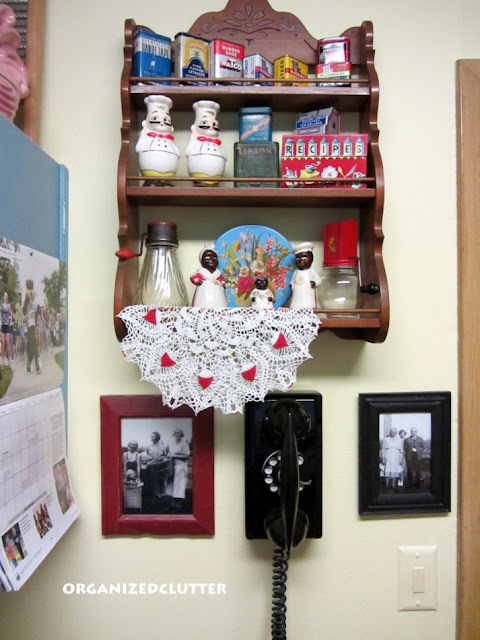 I love, love your laundry room...I love to collect vintage laundry items too, but your collection is fantastic!..I so love the toy irons and the toy ironing board!...Thanks for sharing this wonderfully decorated room!! Your laundry room is absolutely adorable. I love your laundry room. And I just love everything you did to it. so wonderful. I love the colors and the vintage irons. so sweet. You did an amazing job decorating this. I get tired of generic looking homes...with the same stuff just rearranged. Everything you have done looks absolutely beautiful. Love it. In fact I'm going to pour myself some more coffee and look at the rest of your blog just because of this great post. Love it! Thanks for the inspiration. I too have my childhood ironing board...and I've been carting it around the country with no idea as to what to do with it. Did you paint yours? Mine even has a Teflon ironing board cover on it...I'm not sure that it makes it look vintage that way...though it is....it's...ahem... more than 50 years old...LOL! I love it all! The colors are so cheery! I love all the little vintage touches in your laundry room! That would almost make me enjoy doing laundry :) Thanks for sharing at All Start Block Party last week. 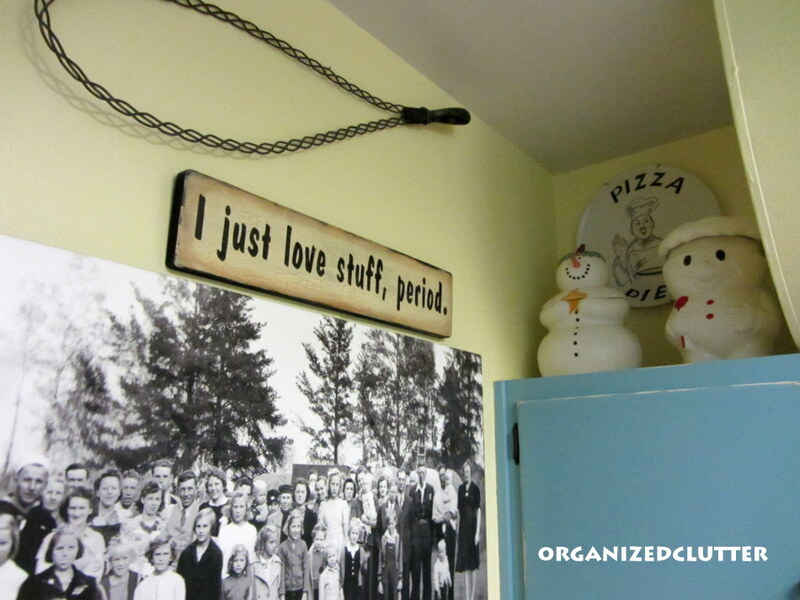 Thanks so much for sharing your beautiful laundry room on Simple & Sweet Fridays. Happy Halloween! What a darling room! Love everything, especially the old cookbook & spice tins! What on earth is the thing over the "I love stuff" sign? Cute , cute , cute... laundry! I will be right over to do my laundry there. Why not?! it's adorable, who wouldn't want to do laundry in that room? I love the embroideries! Did you make them or buy them somewhere?? I purchased the stitcheries from a craft shop already framed.